Admire the Views From the Top of the 2nd Widest Volcano Crater in the World! 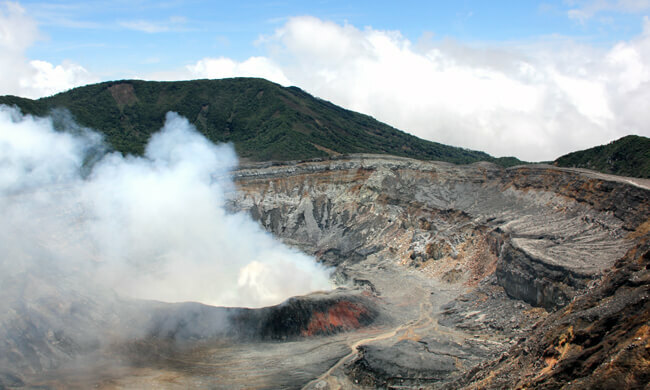 The Poás Volcano is a majestic natural titan with a crater over 1.5 kilometers wide. At the top you can see the volcanic activity from a safe distance and take in the beautiful vistas that surround the area. The tour begins with a relaxing drive along the Costa Rican country that takes you to a rustic coffee plantation where you can try fresh coffee and other delicacies. Once you arrive at the national park, you head up towards the volcano where you take a short walk to the crater. Enjoy the beautiful plants and vegetation that lead you to the heart of Poás. Features: Bilingual guide, transportation, lunch.